The Trump administration’s statement broke a tradition established since the first International Holocaust Remembrance Day in 2006. 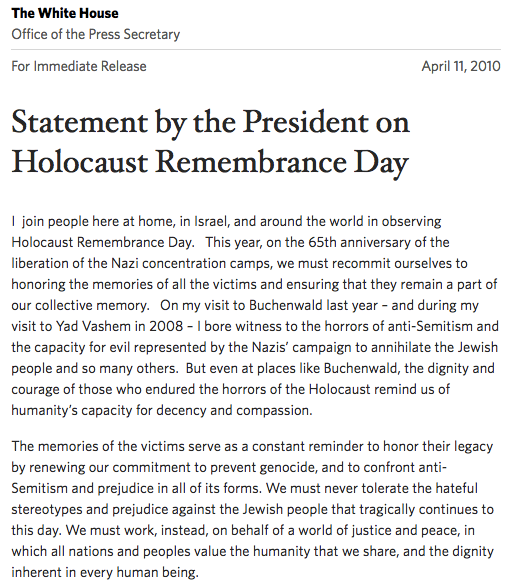 The White House on Friday issued its now annual statement in honor of the International Holocaust Remembrance Day, the first of the Trump administration. But the statement, it was quickly noted, only refers to the "depravity and horror inflicted on innocent people by Nazi terror" rather than the 6 million Jews who perished during the Holocaust. It also makes no mention of anti-Semitism or other issues that are usually brought up when discussing the tragedy. Jonathan Greenblatt, the CEO of the Anti-Defamation League, took to Twitter to air his concerns about the oversight, pointing out the difference with previous administration's statements. When reached for further comment, a spokesperson for the ADL said that the tweets from Greenblatt were the only statement that were going to be issued on the matter. A review of statements issued under Presidents Barack Obama and George W. Bush — the only two to hold office in the time since the day was founded in 2006 — shows that Greenblatt has a point. A search of the archived White House website from Bush's years shows that the first year of the commemoration went unobserved. The next year, though, a statement was issued, calling out Holocaust denial — particularly in Iran — and anti-semitism broadly. 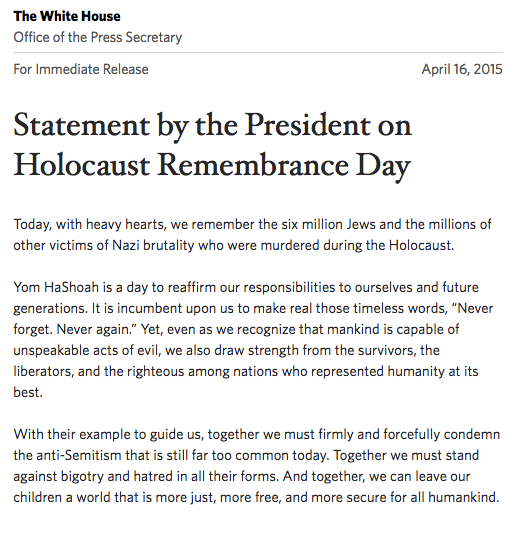 The next year, Bush issued a largely similar statement, but played up his recent visit to Israel's Holocaust Museum. A similar search of all eight years of the Obama administration showed that aside from 2009, when no statement was issued, the number of Jews killed was mentioned in each release. The statements also each specifically referred to Nazi concentration camps, including several that referred to Auschwitz, whose liberation is the reason the annual remembrance falls on Jan. 27. In both 2009 and 2016, rather than issue a press statement, Obama instead gave speeches to commemorate the date. The White House did not immediately respond to a request for comment on whether the omission was purposeful or an oversight.